I’m so excited about this book. From the moment Janet appeared in Ranger Protection, I knew she needed her own story. It was a pleasure to write this novella and I hope you all love it as much as I do. There’s danger, a dog (of course there is! ), a fantastic mystery, and a sweet happily-ever-after all wrapped up in one package. On a deserted country road, Janet West accidentally strikes a woman with her SUV. She gets out to render aid, but is attacked and drugged. When she wakes, she’s back inside her vehicle and the woman—along with the assailant—have vanished. Todd Duncan is shocked by the vicious assault and the haphazard investigation. Unlike the police, he believes Janet. She’s driven to find the woman regardless of the risk and, although Todd’s in town temporarily, he’s not leaving his friend to do this alone. Yet the more they dig into the mysterious woman’s identity, the deadlier the threats become. Someone is determined to keep what happened that night a secret, and if they have to kill to do it…So be it. Sounds amazing, right? 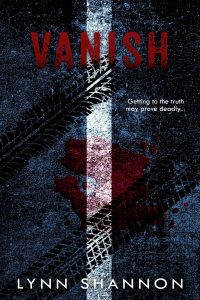 Vanish is available on Amazon right now! Click here to get your copy today.